I never gave the old CASE tractor much thought. After all, it was just a tractor. In 1976, my parents moved from Trenton, Michigan to a brand new colonel home settled in the ‘sticks’ in Brighton, Michigan. In fact, I was the cause of that move due to the fact that I was (and still am) a severe asthmatic. Their theory was, some good ole fashioned country air would be better for me than inhaling the unnatural wonders of city from factories such as the Chrysler Trenton Engine Plant, McLouth Steel and the steam engines that bellowed black smoke into the atmosphere. So I went from breathing the unnatural wonders of the city to the natural wonders of the country – pollen, mold and that flowering wild plant called ragweed – where a single plant may produce about a billion grains of pollen per season. For an asthmatic, ragweed was an airborne version of a boa constrictor for the lungs. Anyway, with the new house came a 300 ft. paved driveway and with a brutal Michigan winter on the horizon, my father traded in his old aluminum snow shovel for a brand spanking new CASE tractor complete with a robust snow blowing unit. I remember many winters being all bundled up in my blue snow suit in the freezing cold watching my dad on his CASE tractor blasting a continuous 30′ beam of pearly white snow from the chute of the blower. I’d always try to stand underneath the end of the stream to get pelted by the snow and every time my dad would bark, “Get the hell outta there!” which always followed with the statement, “If this thing picks up a rock, you’re dead!” I always theorized that the snow would cushion the blow of any rock but what did I know, I was an invincible 6 year old kid. So I stood there, watching in awe how high and far that beam of snow would go. A few winters later, my dad took on the mammoth task of clearing trees, leveling dirt, framing the rink, laying plastic sheeting and piping umpteen gallons of water to create me my very own ice rink in the front yard. For hours, my friends and I were the luckiest kids in the county as we played game after game until the rink become so snowy that we’d lose the puck in a clump of snow. Eventually, we’d throw our sticks into a snow bank and make our way into the house to get warmed up. As we removed our coats, my dad was putting his on as he headed to the garage and fired up our very own Zamboni – the CASE tractor that would clear the rink. In 1983, my parents sold the Brighton house and we moved to the lake house in Howell, Michigan which was only 15 minutes away. That particular winter, my ‘lake friends’ who lived there year round were grinning ear to ear when they looked out the window and saw my dad on his CASE tractor with the headlights beaming as he plowed into all hours of the night making us a regulation sized hockey rink. Over the course of a couple months, we played hundreds of hockey games on that rink and that bright orange CASE tractor and my dad behind the wheel was with us every step of the way. As kids, we had a twisted sense of humor and actually looked forward to hearing my dad scream the occasional obscenities when a frozen hockey puck would get sucked up into the snow blower. It made this horrific sound – kind of like the noise you’d hear when you fire up the garbage disposal and there’s a fork in it. My dad would curse and we’d be red faced holding our bellies thinking it was the funniest thing we ever seen. Year after year, that CASE tractor was our Zamboni. When summer would come around, the CASE tractor was in play mowing the lawn every week and it also created us an awesome baseball diamond in a hay field across the street. The trusty CASE tractor was a fixture in the fall as my dad would hook up this makeshift contraption to pick up leaves, mow the law and haul rotten peaches across the road. I fondly remember the short lived excitement I had when my dad allowed me the ‘privilege’ to mow the lawn with the CASE and after a few weeks of that, I diplomatically said to my dad, “I just don’t feel right using your tractor. That’s your baby.” Seeing right through my BS he’d grumble, “Get your can back on that tractor and finish the lawn.” as he’d crack open a can of cheap beer and flip open the Sports section of the paper which seemed to take him all day to read. I thought nothing of it when my dad and I were talking one day and he said, “Put the tractor in your next auction.” A few days later, I fired the tractor up and backed it out of the garage and gave it a nice tree lined backdrop for the picture. I contemplated the best angle to take the picture so the duck taped covered seat was not the first thing you’d see. The tractor was in all of our American Eagle Auction & Appraisal Company promotional material and even when I saw it in print, I didn’t think much of it. I didn’t think much of it when we loaded it onto the trailer to haul it to the remote auction location. It was not until a couple days before the auction, when it finally hit me. While completing the set up, I took a break from the hot and humid weather and cracked open a cold Diet Coke. As I leaned against the building, I began looking at the CASE tractor and began to think about this machine has been in my life for over 30 years. Not intentional at first, I began to reflect how this machine was oddly, a link to my childhood. I remember sitting on my dad’s lap while he cut the lawn. I remember the hockey rinks. I remember him wrenching on it. I remember how much of a fixture this dang thing was in my life. Then I thought how much I took that CASE tractor for granted all these years and then the guilty feeling that started coming over me that in less than 48 hours, it would be sold to the highest bidder. Just then, my wife pulled in to the auction site with my two year old son Carson in tow. Feeling a bit sentimental, I picked Carson up and said, “Hey Buddy! 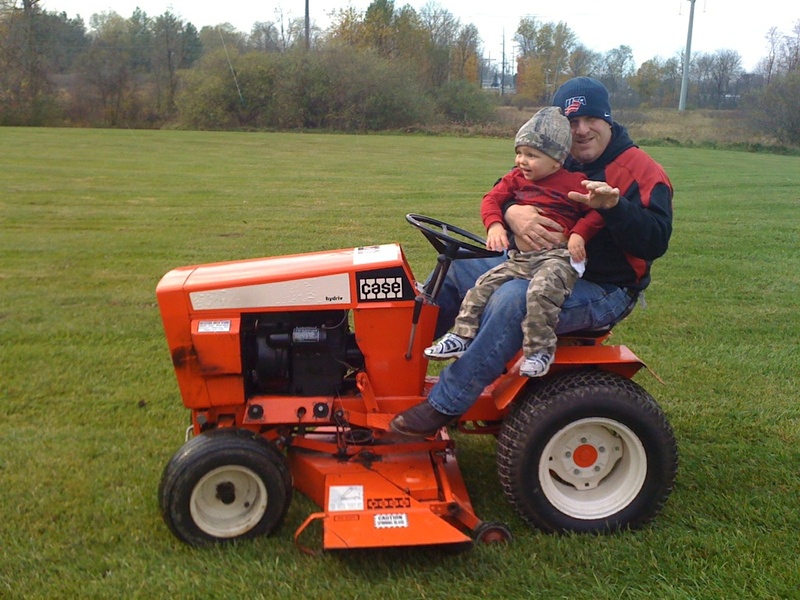 Want to sit on grandpas old tractor?” I picked him up, and sat the little guy on my lap as he grabbed the steering wheel just like I did so many times in the past. I thought about removing the CASE from the auction. Then I thought about just buying it at auction. I thought about a lot of things. Until that day, I never gave the old CASE tractor much thought. After all, it was just a tractor.